This campaign is for Mr. Datta Vishwanath Gaikwad from MUMBAI. He is from lower middle class family. 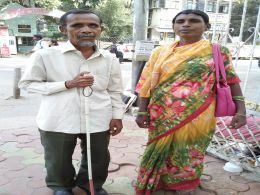 He is PHYSICALLY CHALLENGED PERSON & HE CAN'T SEE THROUGH HIS BOTH EYES [100%BLIND]. He support his sick mother and his wife, so their daily needs are also to be taken into consideration. We are with you Datta ji...good luck to you...god bless..